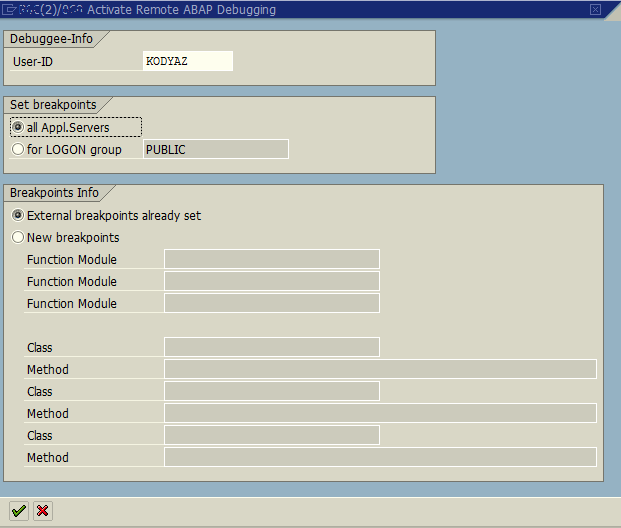 If ABAP developer enable remote debugging in ABAP using RSRDEBUG, programmer can debug another user's session. 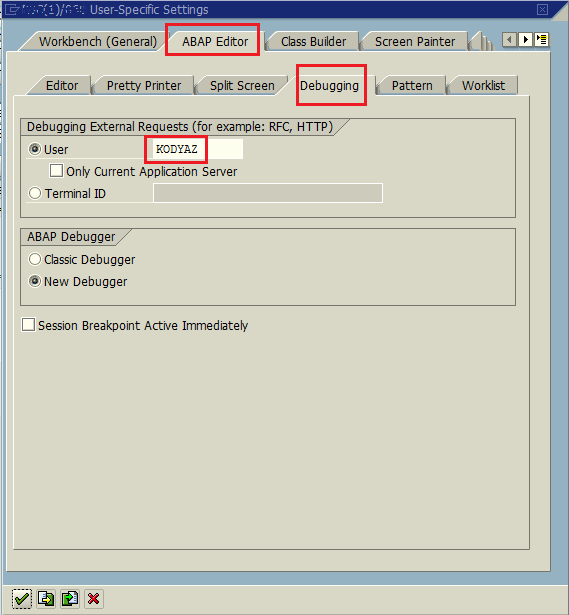 The ABAP programmer has to configure debugging settings to debug the target user and then has to enable remote debugging in ABAP by executing the rsrdebug program. This ABAP tutorial shows how to enable remote debugging in ABAP for a selected SAP user. Open ABAP report or program code, for example the SAP Web Dynpro method within SE80 ABAP Workbench. Switch to ABAP Editor tab. Then choose Debugging Settings tab. Provide the user name which is the user that you want to debug his/her external requests from your session. Within the ABAP codes, add the external breakpoints to targeted code lines. Call SAP transaction SE38, Initial Screen of ABAP Editor. Then execute ABAP program RSRDEBUG Remote ABAP Debugging with Execute icon or F8 shortcut. A list of current remote debugging sessions are listed on the initial screen. To start a new remote debugging session, press F8 or press on Activate Debugging button. When below screen is displayed enter the user name you want to debug and press Enter. A confirmation message dialog screen will be displayed. Do not press any button (Yes or No) until you finish your ABAP debugging task. When you are finished with remote ABAP debugging, press the Yes button to end remote debugging. Now ABAP programmer is ready to debug activities in an other user's session. Let the target user start the application you want to debug. The breakpoint will hit and the developer can continue step by step debugging analyzing the variable values, etc as usual.